What are the foods that cause acne? Many people are looking for ways to reduce their acne and often a change in diet is discussed as being a possible solution. Although it has been stated many times that foods do not cause acne and there are no concrete scientific or medical studies to support the view that food can directly cause acne, there is plenty of anecdotal evidence that does suggest some sort of link between food or diet and acne. There are also studies showing that certain foods and diets can indirectly cause acne by influencing other factors within the body. Of course, there is no golden rule for the foods that cause acne. What some people suggest increases their acne, others indicate has no effect at all on their skin. This is what makes research in this area difficult. Every individual’s body reacts differently to food and therefore what may be true for one person may not be true for another. 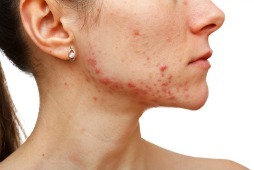 Research into foods that cause acne is also difficult to perform because individuals often do not abide by the strict dietary regiments that are required when performing studies involving food and diet plans. Therefore, there is and probably always will be uncertainty when trying to associate food as a cause for acne. However, certain foods are targeted as being more problematic than others when it comes to acne. In many cases, these foods increase hormone levels in the blood. Higher hormone levels result in more oil or sebum being secreted by the skin and greater keratin protein production, which act together to clog skin pores and eventually lead to acne. More oil on the skin can also trap bacteria and dirt resulting in acne. Certain foods may contain high levels of toxins. These toxins strain the liver, which in turn results in more toxins remaining in the body and this manifests itself as acne as the toxins escape the body via the skin. For those individuals looking for ways to reduce their acne, eliminating foods that cause acne may help their acne skin care problem. If is definitely worth a try because the food we eat plays an important role in good health, disease prevention, and healthy skin care. Listed below, in no particular order, are foods that are suspected in causing acne in some individuals. Anything containing caffeine is thought to increase hormone production and this can lead to acne or more acne. Therefore, coffee, tea, cola drinks, chocolate, or any other caffeine containing food or drink should be avoided. Refined sugar containing foods and white bread, pasta, flour, etc., should be avoided. Elimination or at least the reduction in consumption of these foods helps to prevent surges in insulin and in turn, increased hormone levels in the body. For many people, animal proteins are difficult to digest and therefore, waste products resulting from the consumption of these foods linger in the body. These waste products can then be released through the skin, which results in acne. The presence of hormones in such foods can also elevate hormone levels in the body and result in acne. Consuming alcohol leads to an increase in the testosterone hormone and as explained above can lead to acne. Processed foods fall into the food that cause acne category because they contain toxins such as additives, preservatives, and synthetic colors. Consumption of too many of these foods might overload the liver and the excess toxins in the body can trigger acne breakouts. Nuts such as Brazil nuts, walnuts, almonds, pistachios, peanuts, and others may cause acne in some individuals. Their consumption should be reduced if they are suspected of causing acne. A high amount of trans and saturated fats not only affect overall body health, but may lead to more acne in some individuals. Tuna has been associated with high mercury levels and therefore, should be eliminated to see if this is an acne causing food. In addition to the above foods that cause acne, any other food can trigger an acne skin problem. A person may have a sensitivity, intolerance, or allergy to a certain food and this can cause acne for that person. As with any other ailment that may be related to food consumption, effort should be made to isolate the offending acne causing food and remove it from the diet.